The set started life as a Lego Ideas submission by builder saabfun, who quickly achieved the 10,000 votes from fans required for Lego to consider it for production. It was eventually approved, and while the final version of the Apollo Saturn V looks quite a bit different than saabfun’s submission (Lego modifies the winning models so they’re consumer-friendly) the results will still look amazing perched on your desk. The model, which comes in at a scale of approximately 1:110 (the real Apollo Saturn V stood 363 feet tall), separates into three sections—the S-IC, S-II, and S-IVB rocket stages. It also comes with three display stands if you want to lay it out horizontally in stages like NASA does with the last three Saturn Vs on display around the country. Inside the upper S-IVB rocket stage you’ll find tiny versions of the Apollo Lunar Lander and part of the Command/Service Module, which allowed the astronauts to get on and off the surface of the moon and back home, as well as a pair of Lego astronaut microfigures of indeterminate identity that you’ll probably just pretend are Neil Armstrong and Buzz Aldrin. 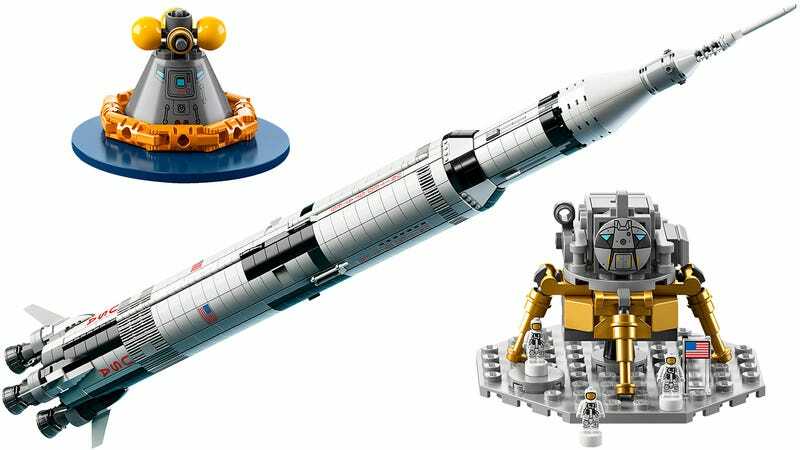 Available staring June 1 for $120, the 1,969-piece set comes hot on the heels of Lego’s recently-announced Women of NASA set that also celebrates space travel and science. It’s just too bad that sets like these are only coming from fan submissions. We love building our favorite Star Wars vehicles from Lego as much as the next adult who never really grew up, but you have the potential to influence a lot of young minds, Lego, and there are so many great pieces of real-world technology that would make for even better sets. How about a replica of CERN next, or the ISS?